A tweet sent out today by HTC product manager Leigh Momii brings some exciting news. If you live in the U.S. and have an unlocked HTC One (M7), or the Developer Edition of the phone, you should be receiving an update any day now. Starting today, HTC's Sense 6.0 UI is getting pushed out to the aforementioned models of HTC's former flagship handset. Weighing in at a whopping 667.15MB, the software version is 5.11.1540.9. 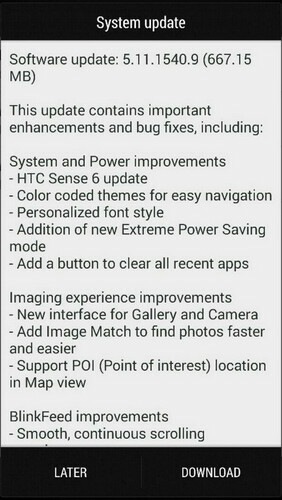 So what will HTC One (M7) owners see from the update? According to HTC's changelist, Sense 6.0 brings color coded themes for easier navigation, the ability to use personalized fonts, and the Extreme Power Saving Mode. The latter is a setting that increases battery life by 40% by turning turning off all but the most basic functions. The update also brings a button that will clear all recent apps. If you own a carrier branded HTC One (M7), the latest news is that the update has reached the final certification stage at Verizon, Sprint and AT&T. Owners of the phone who are customers of those three mobile operators, should soon see the Sense 6 update. T-Mobile customers will most likely have to wait a bit longer since the update is in the development stage for the nation's fourth largest carrier. Keep pumping out the updates, HTC, you're doing great. Did you get the M8 after all ?! Nope, still stuck in my contract and I'm not willing enough to pay for it outright when my current device performs perfectly. But every time I see an article like this with HTC doing something great for consumers, I get a little bit more anxious for it. We'll see what happens, if the M8 Prime is real and makes it's way to Verizon, I would probably get it. I'm holding off on the M8 until then. Yeah same here. Whent out and about and was really close in buying the M8, but then all those M8 prime rumors made me think twice. See how it goes..
Best android UI by far. Good job HTC. I have to agree.. I really like sense on my m8.. I'm not an android guy at all but sense made it presentable for me, a wp8.1 owner too, to like it. The M7 looks better than the M8, much better. I think so too, unfortunately, quite many think different. I have a feeling next year The One will be much better because the head of design is leaving mean hope the new guy will fix all the flaw present M8 had. 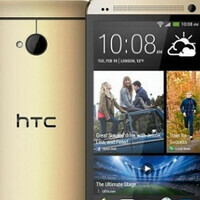 Like bezel, the HTC black bar logo and the power button location, Last but not lease 4MP, need a least 6MP. I have Hong Kong version unlocked HTC one and mine still don't get any updates yet. BTW this update brings any features like Motion Launch which can double tap the screen to awake? I dont think so, because HTC put some extra sensors to make it work.